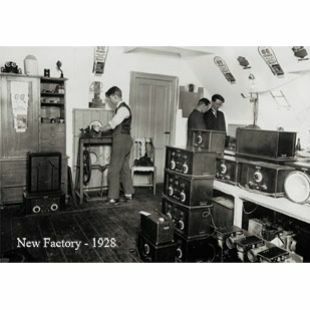 It all started in 1925, when two engineers, Peter Bang and Svend Olufsen, began a modest production of radios in the attic of the Olufsen family home, 'Quistrup'. 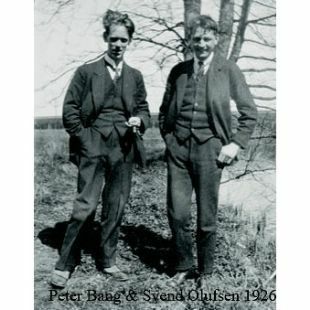 The company of 'Bang & Olufsen' was founded on 17 November that same year by the two young engineers who shared a passion for radio transmissions. Their first product was developed in the attic of the Olufsen's manor house in Denmark where the family still lives today. It was the sturdy '5 lamper' (5 tubes) radio from 1929 that firmly established Bang & Olufsen as a reputable radio manufacturer. In 1930 Bang & Olufsen introduced its first radiogramophone. The following year the company manufactured a tone-film public address system for use in cinemas. This rapidly came in such a demand that a subsidiary was formed to handle this one product. In 1938 Bang & Olufsen introduced the first mains radio with push-button operation: the 'Master 38CH'. The 'Master de Luxe 39' introduced the following year had no less then 16 permanent stations. This was the first time that strict attention was deliberately paid to user convenience. In 1939 they launched the 'Beolit', the first radio with a bakelite cabinet. The Beolit was the start of the famous 'Beo' prefix being used on all major new products. In 1940 Bang & Olufsen introduced dealer campaigns which included eye-catching window decorations and shop fitting ideas. Thus began the now international network of authorised Bang & Olufsen dealers. Despite the German occupation of Denmark during WWII, 1941 saw great optimism at Bang & Olufsen. The Grand Prix 41 introduced a tuning scale that could fold away out of sight, when not in use. On 14 January 1945, the occupation forces totally destroyed the Bang & Olufsen factories. Rebuilding started shortly afterwards and the new premises were operational by 1946, incorporating the newest technological facilities. The year after, the company launched Beocord 84U, Europe's first wire-recorder and which was a forerunner of the open-reel tape recorders. 1948's Grand Prix 48CH was the first Bang & Olufsen 'high-fidelity' radio. During their time together Peter Bang and Svend Olufsen were considered unorthodox in their approach - conventional wisdom held that products of the twentieth century should display their technicalities and little or no attention needed to be paid to their physical appearance. Their innovative ideas were to form the basis of the success of the company in the years to come. Bang & Olufsen is - and has always been - a visionary enterprise. "Making radio receivers in large numbers is something quite apart" wrote the novelist Johannes Buchholtz in 1937. "Although highly developed, radio technology is still in its infancy. The radio set which is state-of-the-art in 1936 seems a bit old-fashioned in 1937. Something has happened in the meanwhile: Bright brains have penetrated the dark and have found out how to improve on the product. All over the world engineers are sitting at their desks, bent over new models. This is what they call competition. Tough competition. The engineers always keep their pencils and erasers close at hand. Never be satisfied. Better – better – better! This is what making radios is like". The demand for change and renewal has hardly decreased since 1937, when Buchholtz wrote these lines. Within the company there has been an unbroken link with family members still taking part in the company's vision. 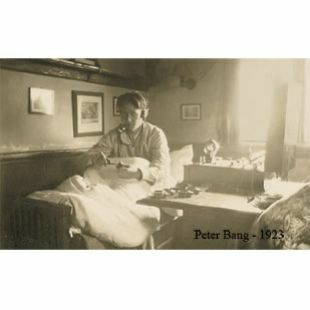 Peter Bang's son, Jens Bang, has been an active member both of the development team and of the B&O Board for many years. Svend Olufsen's family, too, has continued to play an active role within the company. 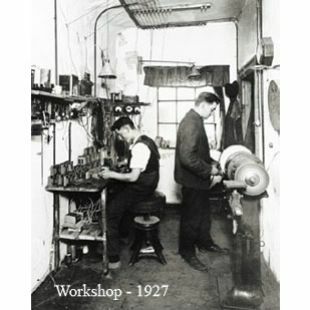 Since 1989 the Board has been chaired by Peter Skak Olufsen, Svend Olufsen's nephew and owner of the manor of Quistrup, where the two young engineers in 1925 took up 'the new radio cult'.